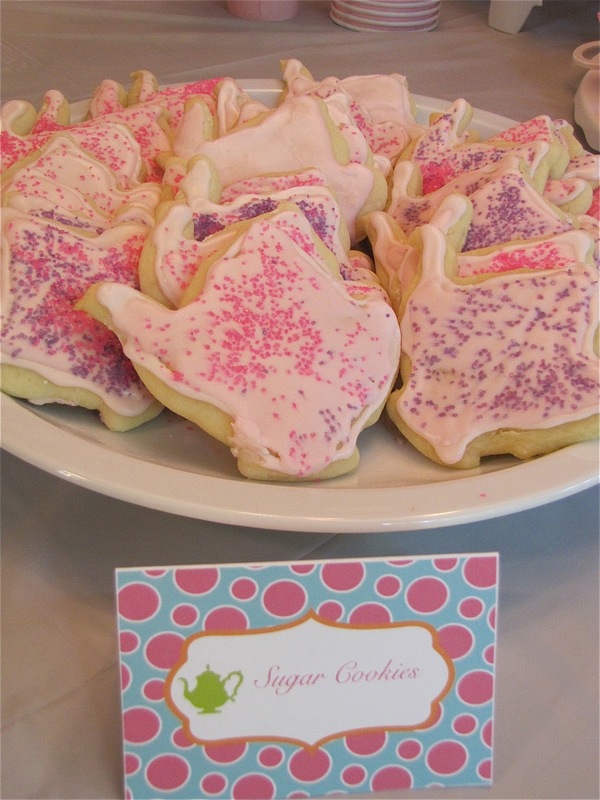 This year I tried a new sugar cookie recipe for Claire's party and I really like how they turned out! They were soft and chewy. Here is the recipe. 1. In a large mixing bowl, cream together butter and sugar until smooth. Beat in eggs and vanilla. Stir in the flour, baking powder, and salt. Cover and chill dough for at least one hour (or overnight). 2. Preheat oven to 400. Roll out dough on a floured surface 1/4"-1/2" thick. If you roll them out too thin they will be crunchy. Make sure to add more flour to the top of the dough to prevent sticking. Cut into shapes with your cookie cutter. Place cookies 1"apart on ungreased cookie sheets. 3. Bake 6-8 minutes in preheated oven. This part can be tricky because you have to know your oven. Mine tends to get on the hot side so I always set my timer for the shortest recommended time and check it. You want the cookies to have "poofed" but not brown or they will be crunchy. Cool completely before frosting. I also tried Royal Icing for the first time this year and I love it! It dries hard so you can stack the cookies without them getting messed up. I didn't do a practice run for this like I probably should have so they don't look perfect but they tasted good and that's the important thing right?! Here is the recipe I used. Start by mixing the water and meringue powder with a mixer until it is incorporated and slightly foamy. Then add the extracts and mix for a second. Then add the bag of powdered sugar. Mix on low until it is incorporated and then on high for a few minutes. It will be fairly stiff. 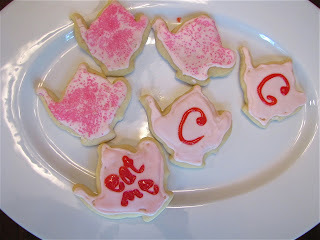 Depending on the technique you are using you need different consistencies of icing. You get them by adding 1 tsp of water at a time. For piping words and details you need the stiff icing you have in the bowl now. For smoothing it onto the cookie you need to thin it out a little. (If you happen to thin it out too much you can add more powdered sugar.) I used the stiff icing from the bowl to draw a border around the edge of the cookie and then thinned it out with water to fill the inside of the cookie. If your doing different colors you would just scoop your icing into separate bowls and color them separately. If you want sprinkles add them immediately otherwise the icing will dry and they will fall off. Here they are at Claire's party. Definitely gonna have to use this recipe for Christmas cookies this year!